You know what parents are like, strong opinions as to what is best for you, mildly tolerant of your motorcycle ‘hobby’, but secretly scared to death you’re gonna kill yourself on your bike. 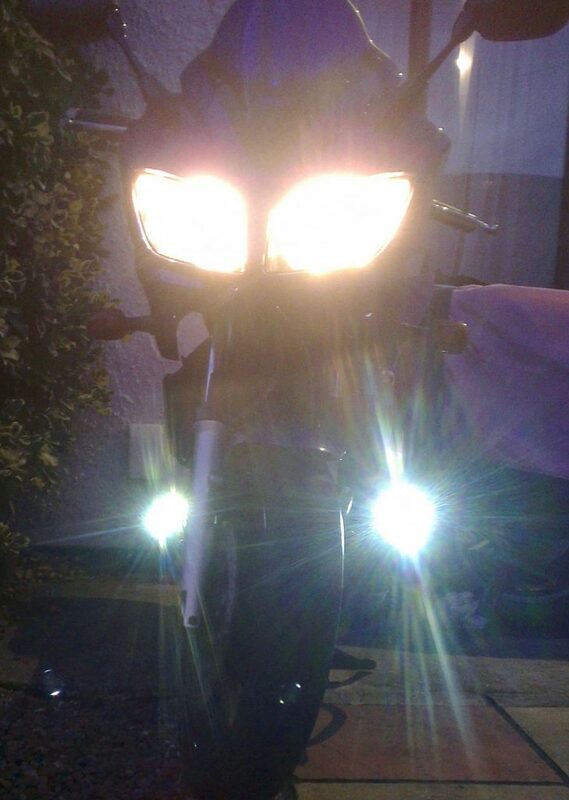 So my old man keeps seeing lots of big adventure bikes adorned with bright spotlights, and declares I must install said distinctive pattern of lights on my bike to ensure I stand out. My Dad has a few odd opinions, but more often than not he’s right. 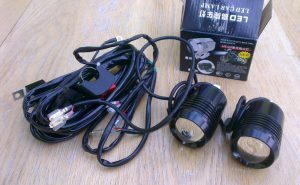 Out of the box the lights seem alright, aluminium cases, nice big clear lenses and reasonable build quality. There’s ample wiring with a bar mounted switch hooked up to a relay. When plugged in, the Cree U2 LED chips produce a decent bright spot without drawing to much power. Specs say 30W each, which if I remember GCSE physics correctly, works out at 5A for the pair and so shouldn’t overload your bike’s charging system. Wiring in was fairly straight forward, though the loom was like the longest conga snake you’ve ever seen… The loom plugs direct into your battery, via a relay triggered by the bar mounted switch. 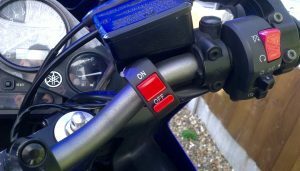 There’s decent connections throughout, with the lights and switch an separate leads which helps with threading all the wiring around the bike. The bar mounted switch is quality enough, though the big red switch looks just like another kill switch. The downer is, by default there’s no relay to cut the power when the ignitions off, so the bar switch will turn them on regardless. So, do wire them in through a relay on a switched live to avoid getting a flat battery when you forget to turn them off (or in case some prat messes with your bike whilst parked up). 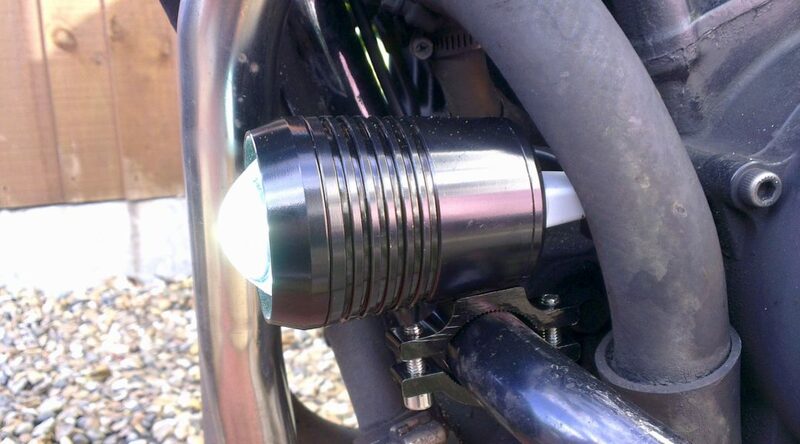 The lights themselves screw onto pairs of u-clamps, perfect for clamping onto some engine crash bars. However the bolt through the clamps into the lights is very small and only grips by a couple of threads in the body of the lights. Because of this I found the lights kept coming loose and swivelling about, such that I have to regularly tighten them up and cover with yet more lock tight. On the road they’ve turned out effective, they certainly provide more light on dark nights, great for spotting potholes and debris. Whether they get you noticed more is a difficult one to say. When you start looking for other drivers noticing you, you start attributing every twitch or glance to people spotting your bright new lights. Nonetheless I do believe I’m finding more drivers giving me an inch as I’m filtering down gridlock on the A13 on a darkening winters night. Three months in, the lights are still holding up ok, but not totally without issue. The main being the light mounts coming loose a few times as mentioned above, but also the lenses have built up condensation inside. Clearly the rubber seal where they screw on is a bit naff. Occasionally when turning on they start flashing like crazy, usually fine again again after flipping the off and on. 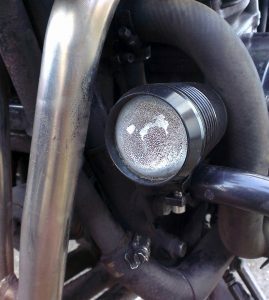 A bit annoying, though only tends to happen when the bike is off – probably just voltage dips. In conclusion, they were as cheap as chips, by no means perfect, but alright enough to get by. They may not last years, but who cares at this price. The flashing is actually an unadvertised part of the circuit design for this specific model. It has two modes. rapid on/off switching is what causes the circuit to swap between them. Newer models of these generic lights (U3, U5, U7) have a high/low/flash that people are modifying the circuit boards to disable them.